You can now specify up to 4 alarms. As said above Calendrian is widely compatible with schedule. The extended appointment information is written into the reserved 'contacts' field of the Agenda schedule format. However if you save an extended appointment with schedule all extended appointment information is lost. 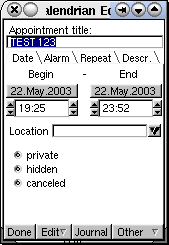 Calendrian is regarded to be early beta, although I switched to it almost completely. You may prefer to keep a backup copy of schedule.dat at hand. 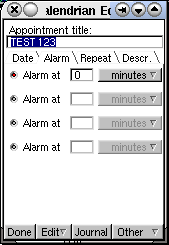 There are some problems with the alarms in Calendrian. 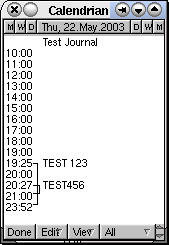 Like schedule, Calendrian starts at jobs to give an alarm at the given time. Unfortunately the at-daemon sometimes just kills this job without doing anything. I wasn't able to find the reason for this behavior, yet. (However after a reboot evrything seems to be O.K. again). Therefore don't rely too much on Calendrians alarms. Once you lost an alarm you need to reinstall the at-job by opening and closing one appointment. This will reinstall the necessary at job. Another problem is that the alarm sound requires special permission. Therefore the system bell is used for alarm instead of "nicer" sound like in schedule. 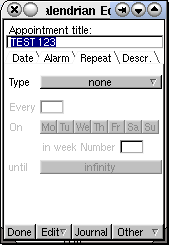 However, you may try to make Calendrian suid-root. This should enable nicer alarms sound, though it didn't on my agenda for unknown reasons. 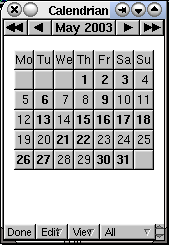 Calendrian is published under the Gnu General Public License (GPL).